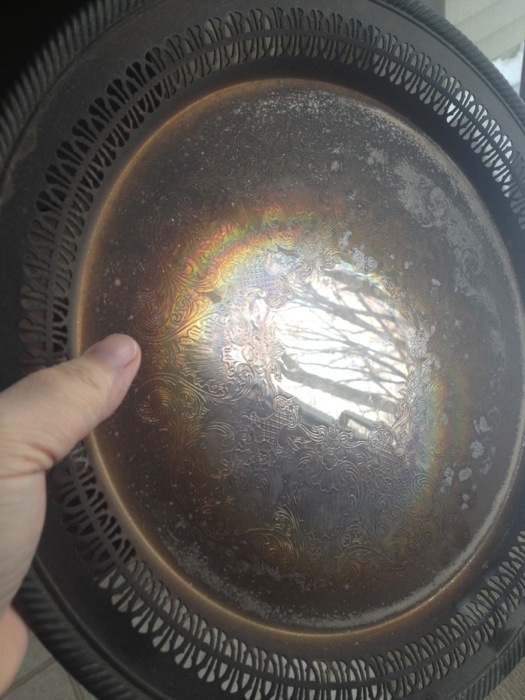 Today I picked up a silver tray I’ve had sitting out in my home and had a moment of frustration about the tarnish on it. It is very common to hear the analogy drawn of silver being refined in fire, but today as I looked at the tarnish and pondered why God created silver to tarnish – He gave me another analogy that ties in with my previous post Growing Cold. You see it isn’t enough to go through the refining fire and be formed into something lovely. There is continual maintenance needed to keep it at its full beauty. In the same way, we must keep ourselves maintained. It isn’t enough to read the bible through one time. We must be in the word and in prayer regularly. If we allow ourselves to get distracted or complacent, we allow ourselves to tarnish. And the longer the lack of maintenance goes, the worse the tarnish becomes and the more difficult to restore to its original loveliness. Father, may we be focused on You. May our hearts meditate on Your word constantly. May we keep an open dialog with You all day … both directions, not just talking to You, but listening to Your voice. Polish us daily that we might shine and reflect Your glory! This entry was posted in object lessons and tagged abiding, our walk by Meghan. Bookmark the permalink.